I am, at heart, a songwriter and producer and I love to create music that resonates with some of my deeply held beliefs. I have loved creating songs, music / documentary videos, and a book for my “Learning History Through Music” program for grades K-8. What was the first thing you remember building/creating? I wrote my first song before age five on the piano. I started piano lessons and I really didn’t care for the music I was supposed to learn, so I made up my own songs. Who or what has influenced and inspired you most in your art/building/creating? Nature has always been deeply inspiring and I remain fascinated with all creatures small or large in the natural world around me. One of my hobbies is photography where I try to capture some of the amazing things – color, shape, a moment, a rainbow. Art, especially paintings and sculpture inspire me, too. When I create music, I often see it as lines and shapes and colors, as tensions and relaxations. When I saw the work of muralist Kimberley Ray, I knew I had to write the book “Goodnight My Honey Bunnies” as her magical depictions of animals in nature really inspired me. The book comes with a free downloadable lullaby album and is available through www.sandywilburmusic.com. What kind of training or schooling do you have that has helped you? I studied many instruments including piano and guitar. I played in a duo in high school that won best folk duo in the state of Connecticut. I went to a very creative college and specialized in music at Sarah Lawrence College in Bronxville, NY, and later went to graduate school at University of California Berkeley to study composing. Next I went to UCLA to study Ethnomusicology (the study of music in culture). I traveled to Oklahoma one summer and lived with Pawnee Indians who taught me a great deal about both their music and culture. I based my Master’s Thesis on what I learned from them and their lessons changed my view of life. What are some challenges you face and how do you overcome them? I simply don’t have enough hours in the day to do all that I am doing or would like to do. My forensic musicology work takes the bulk of the time and I squeeze in any creative time I can. A big challenge is marketing your work. That takes time and personal commitment. I do many readings, lectures, and other speaking engagements but am limited in the amount of time I can do that. What’s the most favorite thing you’ve ever created? The music and video “We The People” which sings the Preamble to the Constitution, was a favorite. I worked with four third graders and a fifth grade rapper to sing the song in the studio and then we did the video with wonderful historical footage interspersed with the kids singing for the first time in the studio. What advice do you have for kids that want to be an artist or builder or creator? 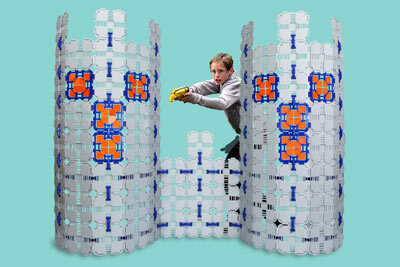 Have you ever built a fort? I built several forts in the woods near my home growing up in Connecticut. They were an important part of my childhood. They felt like magical places where I could imagine anything. I still feel excited about creating something new. Someone once said that a creative person is a “child who survived.” Being able to continue to be excited by what you see and do is an essential part of being creative.